Railroad stocks traditionally perform on-par with the economy: Periods of robust economic growth deliver attractive returns for railroads, and vise versa. For decades, this market-matching performance coupled with poor industry economics explained Warren Buffett's tendency to ignore the railroad sector altogether. In more recent years, however, Buffett's experienced a change of heart, and it's not due to nostalgia for the bygone era of railroads. He sees a dynamic and profitable future for all of the major players, which could result in market-beating performance across the industry. This trend has already taken root and looks poised to continue due to steady long-term U.S. economic growth, a need for low-cost long-haul transportation of goods, and a rail infrastructure that remains the envy of the rest of the world. In May 2012, the International Energy Agency, a leading global alliance and research body, proclaimed the next few decades "the golden age of natural gas." The IEA predicted this clean-burning commodity will replace coal as the second-largest energy source in the world. As this shift rapidly takes shape in the U.S., especially among utility companies, financial pundits have proclaimed the end of the coal era as a major roadblock for certain railroad companies. What the pundits are missing, however, are a few noteworthy trends. Coal's recent unpopularity in the U.S. might be temporary as natural gas prices rebound from their current rock-bottom levels. At the same time, coal is still a highly valued resource around the world, particularly in developing countries in Europe and Asia. These areas of the world have less immediately available natural gas resources, and thus any transition away from coal would take decades, not years, to play out. Let's compare the two trends taking shape currently in the most important coal markets. 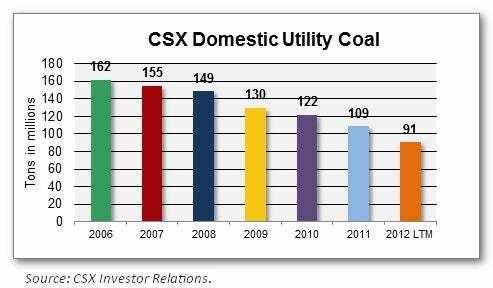 For CSX, America's utility coal demand has steadily declined from its peak of 162 tons in 2006. During this time, many older, less efficient coal plants have been idled, and even the well-run plants have been forced to stockpile coal due to plunging natural gas prices. In the meantime, the U.S. is emerging as a prime supplier of coal globally. As developed countries transition to cleaner fuels, the rapidly rising non-OECD countries in Asia, Eastern Europe, and Africa will drive the majority of growth in demand for coal. 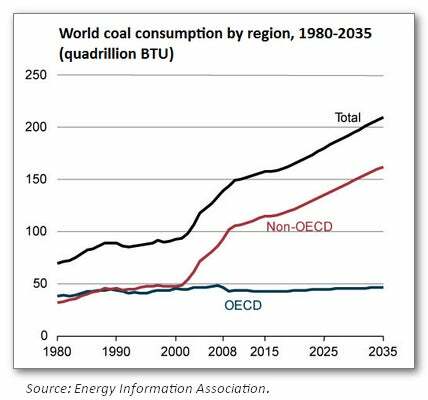 The long-term story of coal demand is quite different from the immediate repercussions of the U.S. decline. In the last five years, CSX's coal export loads have grown from 13 tons to 40 tons, or 207%. Demand in the developing world will boost trade, and in the end that's likely a positive trend for the U.S. Natural gas, a cleaner, cheaper energy source, could become the fuel that propels American GDP growth. Acting as a catalyst for the overall economy, natural gas can actually translate into growth for railroads as well. Focusing so heavily on one critical aspect of railroads' long-term success can distract investors from an even more important development, recently described by The Atlantic magazine as "the insourcing boom." The return of manufacturing to America and the rise in exports is nothing short of revolutionary — yet many investors are unaware of the implications. For shareholders in American railroads, this trade reversal is absolutely critical. Slowly but surely, America is becoming an export powerhouse as many companies bring their core operations back to the U.S. Why? Because labor costs are becoming less critical while transportation costs are becoming more influential in managers' decisions. Since 2000, wages in China have grown fivefold and oil is three times more expensive. America's highly productive workforce suddenly looks more attractive, and the fuel costs to ship goods look more prohibitive. This is why the industrial conglomerate General Electric sees a strong future in manufacturing at its massive facility in Appliance Park, KY. It's also why Apple recently invested $100 million to make Mac computers in the U.S.
As this manufacturing renaissance gains steam, another interesting development is an agricultural-driven commodity boom. As the breadbasket of the world, the U.S. stands to benefit from surging demand for grain and meat to feed a growing Chinese middle class. Many of these commodities will be hauled to East Coast ports like Charleston, SC and Savannah, GA in droves. No wonder the Port of Charleston became the fastest-growing of the 10 largest container ports in the U.S. for the first six months of 2012. Savannah wasn't far behind, notching an annual growth rate of 11% per year for 10 years. The most interesting development is the prominence of exported goods. One-eighth of all U.S. exports by weight go through Savannah, trailing only Los Angeles. While outbound goods make up about 30% of the tonnage at most U.S. ports, that share is 54% for Savannah. Looking well into the future, a rise in manufacturing and agricultural exports bodes well for a railroad connecting America's heartland with some of its most highly trafficked ports. Currently, the U.S. Department of Transportation predicts demand for freight transportation will grow 60% in the next 30 years. Consuming less than a quarter of the fuel as trucking alternatives, railroads like CSX stand to benefit immensely from this growth for years to come. We hope you enjoyed today's sneak peek. Our premium research report also reveals additional reasons to buy or sell CSX currently, a look at the company's management team, and the Foolish bottom line on CSX. Best of all, the report keeps investors informed with a full year of analyst updates. To keep reading, just click here to get your copy today. The article Why This Railroad's a Great Bet for the Long Haul originally appeared on Fool.com. Isaac Pino, CPA owns shares of General Electric Company and CSX. The Motley Fool owns shares of General Electric Company. Try any of our Foolish newsletter services free for 30 days. We Fools may not all hold the same opinions, but we all believe that considering a diverse range of insights makes us better investors. The Motley Fool has a disclosure policy.